It's crunch time in the Bake Off tent this week, which means that the bakers need to pull off something spectacular if they want to impress the judges, and become series champion. According to reports, the final will feature a 'royal' challenge, and will also see the return of meringues; a dessert which can often trip up the bakers. To tie-in with this week's challenge, we've decided to feature this eye catching meringue recipe, taken from the brilliant Good Food website. This particular recipe was created by Cassie Best, a senior food editor for BBC Good Food. Cassie has created so many great recipes for BBC Good Food over the years, and her latest recipe - Toffee Apple Bread & Butter Pudding - is no exception. You can find out how to make to make these Rainbow Rippled Meringues below, but be sure to visit BBC Good Food for the full details, and nutritional break-downs. Makes 21 meringues (7 each of 3 different flavours). Step 1 - Begin by heating the oven to 140°C/120°C fan/gas 1, and then lining 2 large baking sheets with baking parchment. Step 2 - Next, set up your piping bags. You will need 3 disposable piping bags for the three flavours. Using a wet paintbrush, paint lines of undiluted food colouring along the inside of the piping bags. Be generous, because you want the colours to be bold and wash the brush well between each colour so they don't mix. Step 3 - Snip off the end of 1 bag and add your piping nozzle to each bag and put them to one side. Step 4 - Tip the egg whites into a large mixing bowl or table-top mixer - ensure it is grease free before starting. Whisk the eggs with an electric hand mixer or in your mixer, until they hold soft peaks. Step 5 - Begin adding the sugar 1 tbsp at a time, whisking continuously, until you have a thick glossy meringue, which will hold up in a stiff peak at the end of the whisk. Step 6 - Divide the meringue between three bowls and swirl through your chosen flavours that correspond with the piping bag colours. You would want to achieve a marbled effect rather than thoroughly mixing it all in. Step 7 - Put the the piping bag that has your nozzle fitted into a tall glass or jug, and roll the piping bag down over the lip of the jug or glass, to hold it in place. Fill the bag with the flavour meringue that matches the colour in the bag. Lift up and twist the end to seal. Step 8 - Hold the piping bag about 2cm vertically above the baking tray. Apply an even pressure to the bag, slowly lifting the bag as you squeezed, to make a smooth round meringue approximately 6cm wide. To finish with a nice peak at the top, push down a little on the mixture then quickly pull the nozzle away. Step 9 - Continue until all the mixture in the bag is used up but make sure you've left enough room for the meringues to spread. Step 10 - Remove the nozzle; wash it and dry well, then place the next bag in. repeat until you have two trays covered with three meringues. Step 11 - Bake for 1hr, turning the heat down to 120°C/100°C fan/gas 1/2 for the final 30 mins. Remove from the oven an cool on wire racks. Step 12 - Once cooled, there ready for you to enjoy! 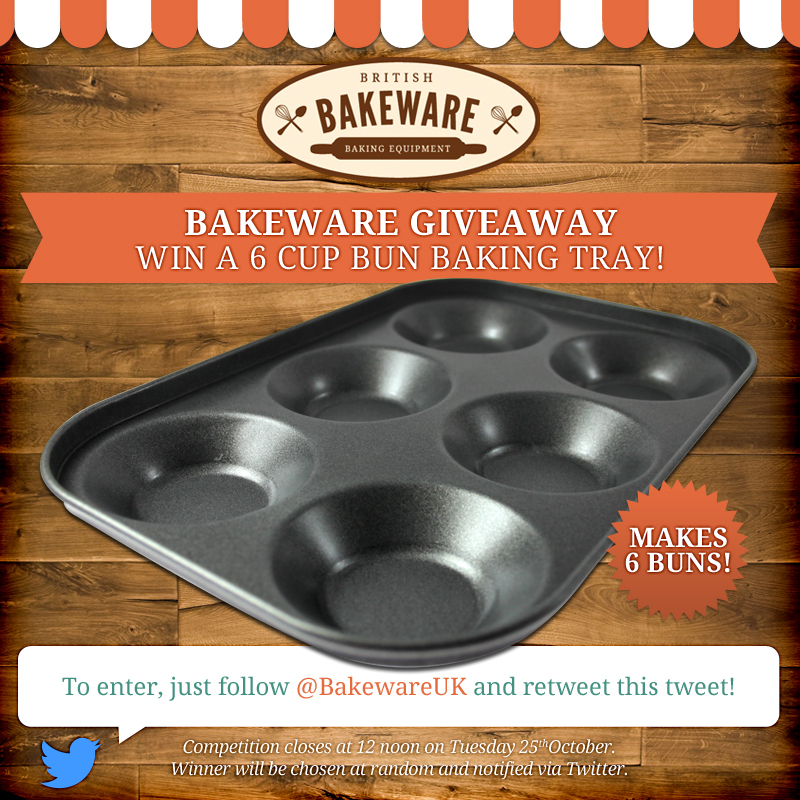 Bakeware Giveaway: Win a 6 Cup Bun Baking Tray! We've reached the Bake Off semi-final! Does anyone else feel like it's gone far too quickly? We're still not certain of who the winner will be, but we're looking forward to seeing the bakers tackle the challenges of Patisserie Week on our screens tonight! If you're an avid fan of Bake Off, or simply a keen baker, you'll know that the art of producing a perfectly crafted patisserie is difficult to master! This is especially true of delicate items, such as the iconically light and fluffy choux buns, which can easily turn out to be every bakers worst nightmare. It can be especially difficult to divide your mixture evenly, in order to achieve the much sought-after uniformity which gives these dishes their impact. Luckily, our bun baking tray makes it easy for bakers to evenly divide their mixture into the shallow ridges, for an evenly proportioned selection of pastries. NOTE: You'll need a Twitter account! Retweet our competition tweet - you should be able to see it at the top of our profile page. Keep your eyes peeled for the winner announcement at 12 noon on Tuesday the 25th of October! This week is the Great British Bake Off semi-final, which means that there's no room for mistakes in the tent, if the bakers want to make it to the final! The theme itself is also set to be particularly tricky, even for the most experienced bakers, as they take on the challenges of Patisserie Week! To tie-in with this new challenge, we've decided to feature a recipe for a quintessentially French pastry, created for BBC Good Food by a Previous Bake Off winner! If you've been watching the show since the beginning, then you may remember Edd Kimber, who became the first ever baking champion back in 2010 (oh the good old days). Since his victory he's been busy writing cookbooks, making appearances, and blogging over at The Boy Who Bakes, which you should definitely check out! Step 1 - Begin by making the crumble topping, mixing the sugar and flour together in a medium bowl. Step 2 - Add the butter, and rub until you have a breadcrumb texture, then press together with your hands to form a uniform dough. Step 3 - Place this dough between 2 sheets of baking parchment, and roll it out until it is a few millimetres thick. Pop it into the feezer on a baking tray until needed. Step 4 - To make the salted caramel, put the sugar into a medium saucepan over a medium heat, allowing the sugar to melt and caramelise, stirring occasionally. Step 5 - Once the sugar is a dark copper colour, add half the double cream. Once the bubbling has subsided, and the remaining cream, butter and salt, stirring to combine. Step 6 - Return to the heat if there are any remaining lumps, then remove, and transfer into a small bowl. Cover with cling film, and chill until required. Step 7 - For the popcorn cream, put everything into a medium saucepan over a medium-high heat, and bring to the boil. Remove from the heat, cover, and allow to infuse for an hour. Step 8 - Strain the cream through a sieve into a measuring jug, pressing down on the popcorn to get as much of the mixture out as possible. Top up the cream so you still have 600ml. Step 9 - Press cling film onto the surface of the cream, and chill until needed (this can be prepared the day before). Step 10 - For the choux, heat your oven to 180C/160 fan/gas mark 4, and line your baking tray with parchment. Step 11 - Using a 5cm cookie cutter as a guide, draw 5 circles onto the parchment and turn over. If you're using our bun tray, you can skip these steps. Step 12 - Put the water, butter, sugar and salt into a medium saucepan, over a medium-high heat, and bring to a rolling boil. Step 13 - Once boiling, remover from the heat and tip in the flour, mixing with a wooden spoon until a smooth paste forms. Return to the heat for a minute or two, to allow the mix to dry out a little. Tip paste into a large bowl and beat for a few mins, to cool down slightly. Step 14 - Add the eggs in one at a time, beating until fully combined each time. Add the last in gradually, as you may not need it all. Stop when the mixture is smooth, and drops off the spoon in a V shape. Step 15 - Using a piping bag with a large round nozzle, pipe the pastry into the circles. Remove crumble topping from the freezer and peel off the parchment, before cutting out round discs to fit on top of each round of dough. Step 16 - Bake for 40 mins until the choux is well risen and crumble is golden. Turn off the oven, but leave the choux in until fully cooled. Step 17 - Use a serrated knife to carefully slice each bun in half. Place a few pieces of popcorn in each, and spoon in some caramel too (you may have to loosen over a bowl of hot water if you have prepared it in advance). Step 18 - For the filling, remove the cream from the fridge and whip until it forms soft peaks. For precision, use a new piping bag with a star nozzle, and swirl onto each bun base. To finish, place the top of the bun back on, and dust lightly with icing sugar. 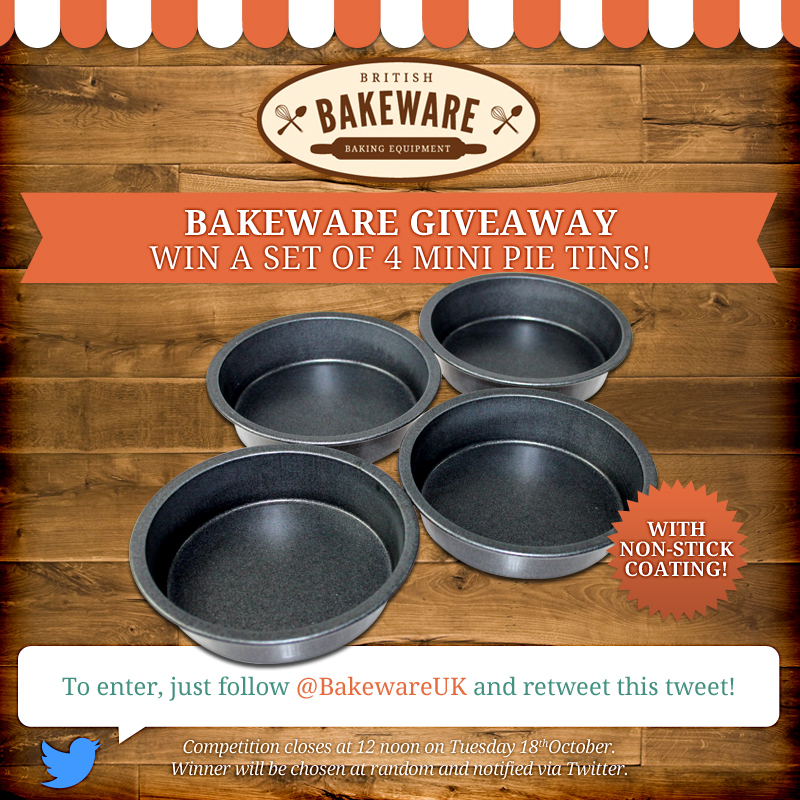 Bakeware Giveaway: Win a Set of Four Mini Pie Tins! Can you believe that it's almost time for another episode of The Great British Bake Off? This week is another first for the show, as the contestants take on the challenges of Tudor Week, which should throw up some not-so-familiar recipes. If you'd like to make deliciously neat and uniform meat pies, that even Paul would be pleased with, then these tins are exactly what you need in your baking arsenal! Handily, they're also non-stick, so you won't have to worry about getting into some bother when you take your pastries out for the big reveal! Keep your eyes peeled for the winner announcement at 12 noon on Tuesday the 18th of October! More Dessert Week Fun: Have you seen our delicious Tudor Cheese Tart recipe yet? Once again, Bake Off have shown us their fondness for shaking things up, by planning another unusual set of tasks for this week's episode. After checking out the preview for Tudor Week, apart from plaits and pies, we were rather confused about what the contestants would be making, which is why we turned to the experts at Hampton Court Palace for guidance. To bring you a recipe which ties in nicely with the Tudor theme of this week's episode, we checked out Hampton Court's website, for some recipes that even King Henry himself would have been happy to eat. Amongst their foodie resources, was a video tutorial for Tarte owte of Lent, which is essentially a baked cheese tart. It's likely that the name for this tart, derived from the fact that it contains cheese, cream and all that other good stuff, which you wouldn't have been able to eat during lent. This makes it a real treat for any time of year, and in addition to this, it's also incredibly easy to make! Step 1 - Preheat your oven to 220°C/200 Fan/Gas Mark 6. Step 2 - Chop up the cheese and pound in a mortar (use an alternative mashing method if you don't have one). Step 3 - Add cream egg and butter to the cheese, and mix it together. This should make a thick cream-like texture, like Cottage cheese. Step 4 - If the mixture is too dry, add in more cream, if it is too wet, do the same with more cheese. Step 5 - Season the mixture with salt and pepper to taste. Step 6 - Either make a freestanding pastry tart case (about 25cm/10inches), or use a tart tin. Also, make a thin pastry lid. Step 7 - Fill the casing with the cheese mixture, before placing on the pastry lid. Step 8 - Seal the lid, and glaze with egg yolks. Step 9 - Place in the oven, and bake for around 40mins, or until the pastry is golden. Step 10 - Allow some time to cool before serving.